Goals can change in a hurry. One minute you're thinking about getting fit and the next thing you know you are training your friends and neighbors. Rates: Depends on session time and number of sessions purchased - see website for details. Online training available as well. It&apos;s hard to tell someone that they aren&apos;t working hard enough, and it may be even harder for that person to understand. Trainers aren&apos;t there to help people pacify their emotions with light workouts that fail to test their bodies and onset DOMS like a sudden thunderstorm. No, they push people to do more than they think, to lift more than they dream, to look as good as they desire. To get there, a trainer like Kathy shares her love, her tough love. She won&apos;t pamper her clients. She&apos;ll stop a workout in its tracks of a client loses focus. For her, it&apos;s not about making you feel good; it&apos;s about helping you achieve your goals. You don&apos;t hire a trainer to pat your back. You hire one because you need a shove to get up that hill of hope. 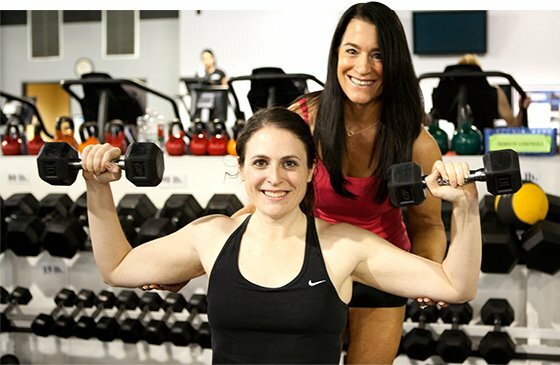 With trainers like Kathy in the database, more and more people will attain those longed-for goals. After college, I spent 12 years in sales and marketing. Once I had my children, I became a stay-at-home mom. After the birth of my second child, I made the decision to become fit and I hired a personal trainer. I became hooked and decided to become certified to help others. We were told that you "walked the walk" to get to where you are today. Can you explain what that means? I was never in good shape. I struggled all my life with dieting and exercise. I can count six commercial diets I tried, as well as other fad workouts. Only when I hired a personal trainer to educate me about strength training did I realize the changes your body can make with weights. Once I learned how to eat clean and properly fuel my body, I noticed changes and decided to take it to the next level and train for competitions. You began competing at the age of 40 and then jumped into the NPC at the age of 42. What made you want to start competing? I started competing with the NPC in 2008 at the age of 40. I participated in four contests and qualified for Nationals after my third contest. I competed on the National stage at the NPC 2010 USAs in Vegas (at 42 years old). Honestly, I had a moment when I exited the stage. I was not trying to win my pro card at the age of 42, nor did I have anything left to prove to myself. Instead of continuing my scheduled contest dates, I retired at that moment and never looked back. I succeeded beyond my wildest dreams and that was enough for me. I think the answer is the same for most of us: to inspire and motivate others. I became certified in 2006. If you would have told me 10 years ago that not only would I love fitness but would go on to have my own personal training business, I would have told you that you were crazy. My training style varies depending on the client. I have clients who know how to work out, but they count on me to change it up and keep it exciting. I have clients who know that without a scheduled appointment with me, they would not come to the gym on their own. I keep the workouts challenging, but at the same time I never want an individual to burn out or dread coming to see me. I always tell my clients: "Unless you have a Swiss bank account, I don&apos;t expect you to be with me forever." Of course, I would love it if that wasn&apos;t true but personal training is a luxury for most people and I teach my clients to fly solo, to not be dependent on me. If we want a nation of fit and educated people, we need to spend time teaching good principles so they are less likely to fall off the wagon when they work out alone. I&apos;ve had clients with all types of success ranging from improving health issues, to losing more than 50 pounds, and helping figure competitors with their prep. One of my best before/after stories is from a young woman in her 20s. We have worked together for more than two years and she has lost 50 pounds. Her transformation has been amazing and I&apos;ve watched her blossom into a confident and secure person. The most satisfying part of working with this client was helping her reach her goals at a young age. And, she still has so much time ahead of her! If the client asks for a meal plan, we first evaluate their goals. If the goal is to lose fat, I ask the client to keep a food journal for me. To me, the most important thing is to teach the client how to eat and make food choices, not give them a textbook meal plan to follow. "Once I see their daily food intake along with activity levels, we make a plan together." Once I see their daily food intake along with activity levels, we make a plan together. I use a session to get input from the client as to their likes and dislikes. Together we devise a meal plan that will work. I encourage small meals throughout the day and show clients where certain macros are more important (more carbs pre- and post-workout) as opposed to carbs at bedtime. I have learned over the years that the more a client understands why they eat a certain way, the higher their success rate will be opposed to the uneducated client who follows a cookie-cutter approach to diet. The same goes for my training programs&mdasheach client has different needs and we spend a lot of time in the beginning understanding how each exercise relates to the next and why I use a particular order of exercises or body parts in a workout. I think the biggest misconception is that all the work is done in the gym and then people forget about the accountability once they leave me. I explain to each client from the beginning: I only represent "so many minutes" in their week and the rest of the work is on them. You can&apos;t out-train a bad diet, and don&apos;t blame me when things don&apos;t go the right direction. I feel the biggest mistake is when the assumption is made that the same training program will work for all clients. Some trainers get in a routine and rarely change it. And most importantly, remember training time is the client&apos;s time—you get paid regardless so listen to their needs and realize that each person has different goals. That depends on the client and their needs. I have clients who see me on a weekly basis and some who may come in once per month to have me change up their workouts, etc. I ask a lot of questions about their schedule, weekly activities, etc. I find ways to educate and have "teaching" moments when they tell me about their busy schedules. Do you feel age plays a role in personal trainers and who they get as clients? Not really—I believe there is a market for everyone. I work with all age groups. Honestly, I don&apos;t change my style one bit. I have certain exercises that I utilize more (for example, bench press) but depending on whether they want to add mass or lose weight, the style is the same for both. Oh yes! I&apos;ve definitely taken on more of a "tough love" approach when it comes to getting results. I&apos;m patient, but at the same time, the client must take responsibility for their actions outside of the gym. I refuse to take the blame for results not seen in a timely manner. One of my first potential clients brought pictures of various female celebrities to our first appointment. She told me she wanted J. Lo&apos;s glutes, Jennifer Anniston&apos;s arms, Gwyneth Paltrow&apos;s legs, etc. She was serious. I told her to find a new trainer because it was obvious her expectations were going to be unrealistic. Each client fills out a detailed questionnaire focusing on health history and goals. I ask each client to fill out a separate goal sheet with both short- and long-term goals; I ask them to include the ways they plan to execute their plan. I found this helps keep them accountable to me and to themselves. Once I see their workout history, I can assess at which level to begin their program. "Each client fills out a detailed questionnaire focusing on health history and goals." No preference at all. Each client is trained as an individual, regardless of gender. Most definitely but I wouldn&apos;t have it any other way. I don&apos;t care what your goal is, fitness is hard work and it tends to bring up different emotions for people. In order to be 100 percent in touch with my clients, I want them to share their feelings with me—good or bad. I&apos;ve stopped many sessions with clients because I can tell the time left in the session would be better utilized discussing what&apos;s on their mind. They can&apos;t move forward if they can&apos;t let go of what&apos;s bringing them down behind the scenes.